Catsparella: Fancy Feast to Donate $1 to Adopt-A-Pet.com for Every TasteMakers Contest Vote! Fancy Feast to Donate $1 to Adopt-A-Pet.com for Every TasteMakers Contest Vote! Now here's a campaign where every vote really counts! 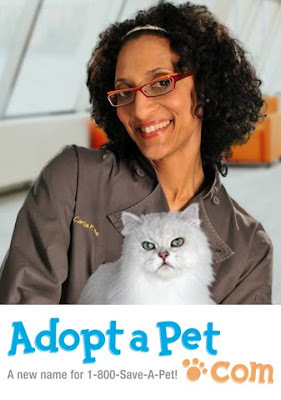 Back in May, I posted about how Fancy Feast teamed up with Bravolebrity chef Carla Hall for the TasteMakers contest, designed to help discover the newest Fancy Feast Elegant Medleys entree. Well, the top five finalists in the culinary competition have finally been announced, and now it's time for the public to cast their vote in the epic battle for cat food supremacy! Every day from now until August 8th when you visit fancyfeast.com/tastemakers to vote on recipes such as Gussy's Grill, Purrrfect Sushi, Spencer's Delight, The Best of Land and Sea, and Flavors of Italy, the Fancy Feast brand will automatically donate $1.00 (up to $25,000) to Adopt-a-Pet.com, a non-profit adoption charity that helps shelters, humane societies, SPCAs, pet rescue groups, and pet adoption agencies advertise their homeless pets to adopters for free. So what you're saying is, I vote once a day, Adopt-a-Pet.com gets moolah, and one lucky finalist walks away with their own Elegant Medley's entree, 10 grand, and a year's worth of free noms? No kitten! "No kitten" - I'm cracking up.